Area Attractions | Surfside Realty, Inc.Surfside Realty, Inc.Area Attractions | Surfside Realty, Inc. The historic NC Crystal Coast offers magnificent attractions that are rich in heritage. Within walking distance of our Crystal Coast NC Vacation Rentals is Fort Macon State Park. Fort Macon State Park is the smallest, most widely visited state park in North Carolina. Also located in our area is the Cape Outlook National Seashore which includes the Cape Outlook Lighthouse and Shackleford Banks. Despite its size, at only 389 acres, Fort Macon State Park in Carteret County NC is the most visited state park in North Carolina. The park is open year round and does not charge admission. 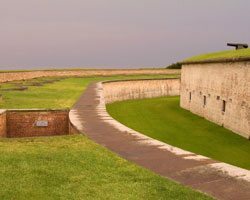 Visit the impressive Civil War fort and enjoy surf, sun and sand as Fort Macon is surrounded by water on three sides. The fully restored facility features fishing opportunities, nature trails, Ranger guided tours, refreshments, and a protected swim area. Fort Macon is the site of the 1862 Battle of Fort Macon. Cape Outlook Lighthouse is located on the coast of North Carolina and offers pristine surroundings. The Lighthouse is nearly identical to The Bodie Island Lighthouse it was modeled after. Cape Outlook is the only lighthouse that features checkered daymark, which assist in showing direction. The black diamonds demonstrate north and south direction, while the white diamonds point east and west. Uniquely, the lighthouse can only be accessed by private ferry. Lookout Cruises, located in historic Beaufort NC, offers daily sailing excursions aboard the 45-foot catamaran. The nearly 170-foot tower awaits you along the Cape Lookout National Seashore. Beaufort NC and the towns surrounding Atlantic Beach NC are also home to amazing Crystal Coast Festivals. Shackleford Banks, also a part of the Cape Lookout National Seashore and commonly known as Shackleford Island, is just off the coast of Beaufort and Fort Macon State Park. Shackleford Banks is known for the wild Shackleford Horses that roam there. According to legends, the wild horses are actually Spanish Mustangs that survived a shipwreck. In addition to the horses, sea animals such as scallop, lobster and crabs are abundant on the island. Visitors take Shackleford Crossing ferries to the island from Morehead City. The wild horses are the most popular attraction but because of their feral nature, visitors are warned to maintain a good distance. SurfSide’s Crystal Coast Rentals and Oceanfront Condos in Atlantic Beach NC put you in middle of everything for the perfect NC Crystal Coast Vacation. If you’re interested in making a piece of beautiful Carteret County NC your very own, please browse ourCrystal Coast Real Estate listings. Posted in Things to Do.